The global home security solutions market features an increasingly competitive and fragmented on account of the presence of several players at regional and global footprints, notes Transparency Market Research (TMR). A growing number of players are focused on unveiling technologically-advanced solutions to meet the current diversity of consumer demand, observes TMR. Several companies in the home security solutions market are also making strategic moves with the aim of consolidating their presence across new geographies. Top players are also investing substantially in research and development to bring innovations in the market. Some of the prominent players in the home security solutions market are Axis Communications AB, SimpliSafe, Frontpoint Security Solutions, Honeywell International Ltd., Tyco International Ltd., and Vivint Inc. 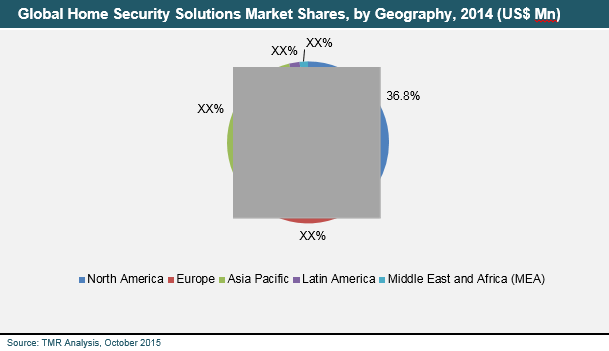 The global market for home security solutions generated a revenue of US$8339.2 million. Rising at an impressive 18.0% CAGR during 2015–2022, the global market will reach worth of US$30,293.0 million by the end of 2022. Of the various component types, the hardware segment is expected to rise at promising pace in the home security solutions market. The growth is fueled by the rising uptake of video surveillance systems in various security applications such as in home-based criminal incidents and home invasions. On the geographical front, North America held the major sway in the global home security solutions market in 2014 and is expected to rise at the most attractive CAGR of 18.4% during 2015–2022. The growth in the region is fueled by the rapid strides that construction activities have taken in the region, especially residential renovations. The rising demand for home security solutions for controlling access at various spaces is a key factor driving the growth of the home security solutions market. These solutions are increasingly being demanded for controlling unwanted and unidentified individuals and unscrupulous elements at homes and office spaces. Burgeoning demand for home surveillance systems by home owners to prevent intrusions is propelling the market’s expansion. Deployment of more stringent access control systems at offices is fueling the rapid growth of the market. Furthermore, growing awareness about the benefits of smart home automation is bolstering the demand for home security solutions. In developed and developing nations, security concerns have escalated in recent years owing to rising activities by unscrupulous elements. This has increasingly fueled the demand for home security solutions across the region. The market has also been gaining momentum from the advent of better security technologies for smart home automation. Substantial advancements in smart cards voice transmission, biometrics, and asset tracking system have opened several lucrative prospects. However, the high cost of home security solutions and high maintenance cost has considerably restrained the uptake. In addition, in less developed regions, low rate of IT awareness and reluctance to shift to smart home automation among elderly home owners are key challenges in the expansion of the market. Nevertheless, in the coming years, prices of home security solutions are expected to decline. Moreover, the increasing trend of service bundling is unlocking new, exciting prospects in the market. Moreover, recent efforts by industry players to offer solutions integrated with numerous smart features are also expected to boost the market over the assessment period.